S. 227** x 135 mm. Mademoiselle Rose Bertin, whose real name was Marie-Jeanne Bertin, was the "marchande de modes" or "modiste" to Marie-Antoinette after 1770, and as such is to be considered as the first French fashion designer. *** She is depicted here wearing a silk dress with pronounced decolleté and wrap, both done up in bows. Her hair is dressed in layered curls and tied together by a pink ribbon surmounted by a mob-cap. 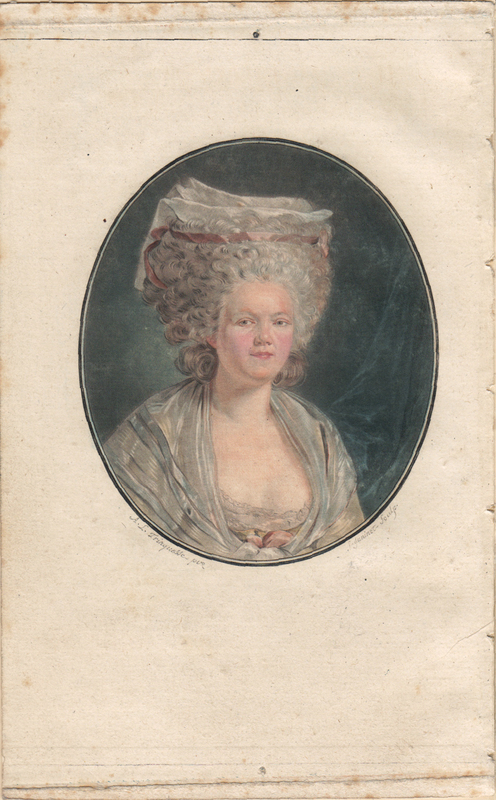 This print is considered to be exceedingly rare (according to Portalis & Beraldi, "On ne connait de ce portrait que quelques rares épreuves...); we have only been able to locate three impressions in public collections (see below), and we have not been able to find any impressions at all on auction. Furthermore, they qualify Mademoiselle Bertin as a masterpiece of color printmaking: "Chef d'oeuvre de gravure en couleur ; jamais on n'a obtenu plus de fondu et plus de harmonie dans les teints. Le modelé est aussi très remarquable." - the present impression also comprises the two signatures of "f. Janinet sculp." and "A. L. Trinquesse pix", and a handwritten note on the mount specifies "seule épreuve connue avec le nom de Trinquesse dans cet état". As Trinquesse was in fact named Louis-Roland, it may well be that this typographical variation was the reason for an early removal of the signature. Otherwise the only variant in lettering that we have encountered is the mention in Portalis and Beraldi of an impression before Janinet's signature, sold in February 1881. In fact, the rarity of the Trinquesse signature is also apparent insofar as this print is often described as after Fragonard (see http://www.metmuseum.org/collection/the-collection-online/search/369411), to whom certain works by Trinquesse have been misattributed. * This impression was sold at the Henri-Jean Thomas sale in Paris on 17 June, 1948, at a hammer price of 270,000 French francs, which according to the INSEE purchasing-power conversion page (http://www.insee.fr/fr/themes/calcul-pouvoir-achat.asp), equals more than 9,300€! ** The platemark above and below is exceptionally apparent on the present impression, and measures 202 mm., whereas laterally it is trimmed to the square borderline (see the photograph).